Don’t we all need some of this, right now? A few weeks ago we showed several Recession Red approvals. In another dismal sign of the times, the Recession-themed wines apparently hit a lot of nerves. Recession Red is selling well, and our Recession post got more traffic than any other topic to date, by five times or more. 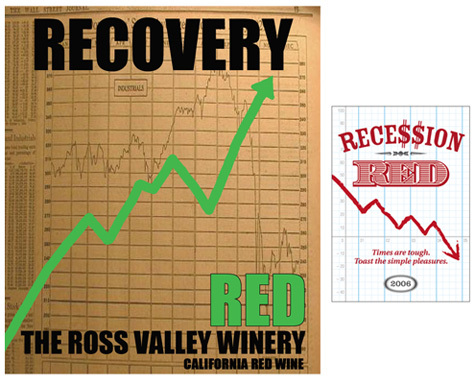 The Recovery Red wine (above), is produced and bottled by Ross Valley Winery of San Anselmo, California.